Homeopathy is commonly described as a system of medicine but this is misleading. More accurately, it can be described as a collection of scientifically unsupported and unconnected beliefs that date from a pre-science era and yet which homeopaths believe serve as the underlying principles of a safe and effective healthcare treatment. The main principle of homeopathy is the idea that a substance that causes symptoms in a healthy person can be used in minute doses to treat people suffering from disorders that produce similar symptoms. An example frequently quoted is the use of allium cepa (onion) to treat disorders such as hayfever and colds, that cause watering eyes . The curative power of medicines, therefore, depends on their symptoms, similar to the disease but superior to it in strength, so that each individual case of disease is most surely, radically, rapidly and permanently annihilated and removed only by a medicine capable of producing (in the human system) in the most similar and complete manner the totality of its symptoms, which at the same time are stronger than the disease. Samuel Hahnemann, Organon of the Art of Healing, §12-26, sixth edition. This idea of similia similibus curentur — ‘like cures like’ — can be traced back to Hippocrates (ca. 460 BC–ca. 370 BC]). Hippocrates, who is regarded as the father of modern medicine, was a more rational thinker than many of his contemporaries; he rejected the idea that sickness was caused by evil spirits, for example, and his ideas about medical practice gave rise to the principles that are the basis of modern medical ethics: primum non nocere ‘first do no harm’, maintain patient confidentiality and share knowledge and experience with colleagues. Some homeopaths believe this gives all his ideas the weight of authority. Homeopaths call the belief that like cures like the ‘similia principle’ or the ‘Law of Similars’, though it is not a scientific law. It is, like all aspects of homeopathy, highly controversial. There is no logical reason why substances that produce symptoms should cure such symptoms and no good evidence any one of them does. Visit the Science page for more on the similia principle and for information on the other fundamental principle of homeopathy, which is the idea that diluting and shaking an ingredient increases its potency. 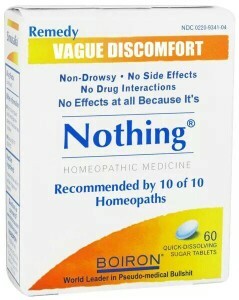 This is the feature of homeopathy that attracts the most derision. There are various other principles of homeopathy and many of these are covered on the Origins page of this site.